Attempts by WestJet’s competitors to flood the London market with capacity in order to undermine the low cost airline’s widebody experiment in the London Gatwick market have not produced the end result of driving WestJet from the trans-Atlantic space. WestJet is sending a clear message to its competitors that it plans to remain firmly entrenched on long haul routes. The company is currently examining options for more widebody aircraft, and is discussing further long haul expansion with its pilots. After a rocky start to its highly anticipated long haul service to London, WestJet is posting load factors on its routes to Gatwick that are higher than system average, and concludes that the flights are delivering positive returns. An interesting pattern in WestJet’s passenger composition on the company’s trans-Atlantic service to Gatwick is the number of US-originating passengers from large metropolitan areas that currently have nonstop service to London – a dynamic that the airline attributes to its lower fares. The US-originating customers are boosting WestJet’s sixth freedom traffic flowing over Canada to long haul destinations. In May-2016 WestJet became the first North America-based low cost airline to broaden the low cost model on long haul flights across the Atlantic. The company added used Boeing 767s to the fleet for the launch of year-round flights from Calgary and Toronto to London Gatwick, and seasonal service from Vancouver, St John’s, Edmonton and Winnipeg to Gatwick. WestJet operates four Boeing 767 widebodies on the route in a 262-seat configuration – 24 “Plus” reclining seats and 238 economy seats. WestJet charges for meals, checked bags and seat selection on the flights. Orders include those placed directly by the operator and by lessors assigned to the operator, from 27-Sep-2016 onwards. The company’s trans-Atlantic debut was marred by operational disruptions stemming from aircraft mechanical problems, and shortly after the problems occurred WestJet declared that the issues were creating grief for the airline. Recently WestJet CEO Gregg Saretsky offered some insight into the mechanical problems to investors, stressing that the challenges had nothing to do with the company’s organisational capability, “and everything to do with the health of the aircraft we received”. Under WestJet’s arrangement it acquired the aircraft from Boeing, who purchased the jets from Qantas. Boeing’s responsibilities included repainting, reconfiguring and refurbishing the aircraft interiors, and providing a clean bill of health for the aircraft, said Mr Saretsky. Problems alledgedly occurred with the maintenance, repair and overhaul company selected by Boeing to perform the work on the 767s. Mr Saretsky stated that WestJet was receiving the aircraft anywhere from 50 to 120 days late and the first jet had more than 200 snags – but none of the issues had compromised safety of flight, he explained. It took WestJet two months to smooth out the mechanical issues, and during that time the airline hired Omni Air International to operate services when the 767s needed repairs. Mr Saretsky declared that WestJet was holding discussions with both Boeing and the MRO provider for the additional expense that “we incurred as a result of the poor workmanship”. Previously WestJet has cited pressure in its unit costs excluding fuel for 2016, created by the expenses associated with the irregular 767 operations, which included using a third party contractor and compensating passengers for delayed flights. The company now expects its unit costs to increase 2.5% to 3.5% versus previous estimates of an increase ranging from 0.5% to 2.5%. At the high point of WestJet’s maintenance challenges with the 767s a lot of attention was placed on the age of the aircraft, which for WestJet averages 24 years. Mr Saretsky was quick to dismiss any concerns about the age of its widebody jets, noting that American, Air Canada, Delta, British Airways and KLM all reliably operate 767s of the same vintage. Prior to launching its London Gatwick flights WestJet faced some investor trepidation about its long haul plans, given Canada’s tenuous economic environment driven by weakness in the country’s Western provinces due to the downturn in the oil business. WestJet took great care to stress that the 767 operations were a low-risk exercise; Mr Saretsky characterised the new flights as “almost a throw-away experiment” to see if the markets made sense. Mr Saretsky then recently expressed some regret over characterising the 767 operations as an experiment, explaining that it had triggered competitors to do “silly things”, including adding significant capacity in the market. WestJet’s main rival Air Canada did not sit idly by as the low cost airline entered the lucrative trans-Atlantic market with nonstop flights. Air Canada reacted by introducing its own flights to London Gatwick (it serves London Heathrow from several Canadian airports) through its low cost subsidiary rouge. 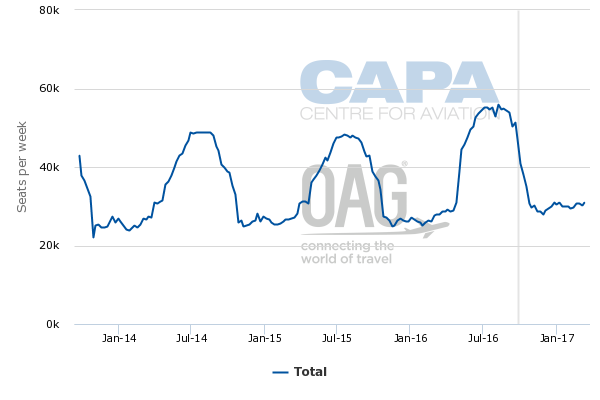 Data from CAPA and OAG show that overall in early Jul-2016 seats between Canada and the UK grew 15% year-on-year, with Air Canada posting 6% growth. British Airways’ seat numbers fell slightly in that period, and Air Transat’s seats increased approximately 4%. Mr Saretsky stated that WestJet’s returns across the Atlantic would be better without the excess capacity; however, the company was happy with the performance of those routes, which have met the company’s goals of being accretive in year one. One observation Mr Saretsky offered regarding the new service is that many passengers on the Gatwick flights originated in the US, in larger metropolitan areas including Boston, Phoenix, Newark, Los Angeles and San Francisco that feature nonstop service to London. The stopovers for those passengers in Canada are driven by WestJet’s lower fares in the markets, and Mr Saretsky cited the benefits of the incremental transborder passengers at a time “when the weaker Canadian dollar is creating headwinds for us”. Although WestJet is enjoying a boost from sixth freedom traffic for its nonstop trans-Atlantic service from the US, it has no feed for beyond flights from London Gatwick. The airline approached British Airways about extending their current codeshare to cover flights beyond Gatwick but British Airways declined WestJet’s offer. As a result, WestJet has decided to end its codeshare with British Airways in Oct-2016 – the agreement covers WestJet’s flights to Canada’s interior beyond the country’s gateways. The dissolution of the codeshare is an interesting by-product of WestJet’s trans-Atlantic expansion, but it has not deterred WestJet from plotting further growth across the Atlantic; nor has the airline been deterred by the additional capacity ushered in by its competitors to quash WestJet’s trans-Atlantic experiment. Mr Saretsky has stated that WestJet is in the market looking for additional widebodies to operate further international expansion, and is also holding discussions with its pilots in order to facilitate that growth. WestJet is drawing a line in the sand, stressing that its foray into the nonstop long-haul trans-Atlantic market has moved far beyond the experimental stage. The airline is staking a claim in a market it can hardly walk away from if it wants to reach and maintain its return targets over the long term. During the decades-long duopoly that WestJet has held with Air Canada in Canada’s domestic market WestJet has survived heightened competition with its larger rival. Now WestJet consistently needs to prove that it can handle attacks from its familiar rival in the long haul space. Want More Analysis Like This?